JUST REDUCED! NO HOA! 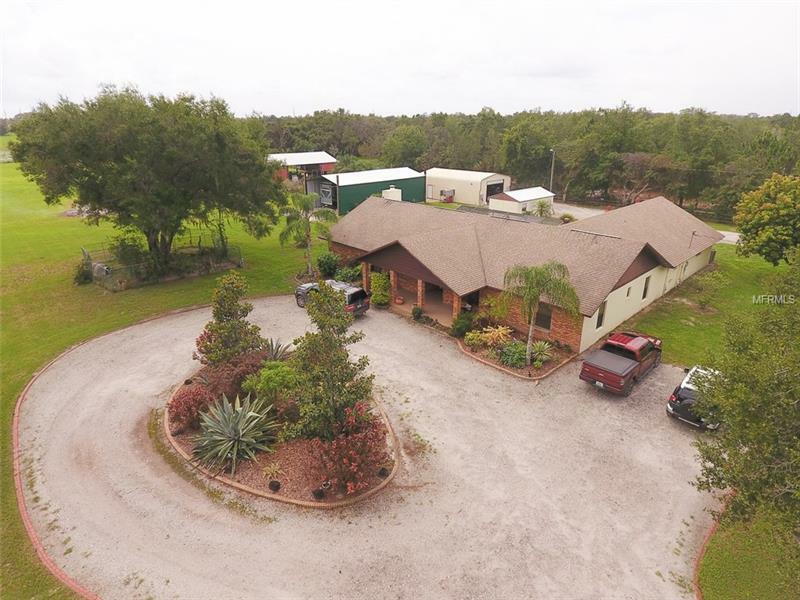 One of a kind gated estate located on 5.19 acres of land at the end of the street. Beautiful Ranch style pool home with 5 bedroom 3 bathroom that includes an in-law suite and or 23 x 30 bonus room with separate entrance and kitchen. Large living room with wood burning fireplace. Kitchen offer plenty of cabinets and counter top space with eat-in area and open to living room. The home features are Terracotta style tile flooring, wood finishing, valuated ceilings, inside utility room and much more. Enclosed outdoor patio with sitting area and pool which is great for entertaining. Other features are a pole style barn with siding, measuring at 25 x 54 large enough to park your boat or RV and is equipped with 50 amp power service and water hook up to keep it maintained. The other three buildings include a 14 x 25 office with ac and storage as well as a 25 x 40 fully air conditioned and powered workshop for your DIY home projects as well as a 50 x 30 covered barn. Large open area with pond. Private electric gate entrance and call box. Over-sized driveways. Bring your horse and put up a corral and pasture. THIS HOME IS A MUST SEE FOR A BIG FAMILY!